Focus on Scam Websites Part II – Paying over the odds to part with personal details. Extreme-sports? Do not let this latest wave of scam emails trick you into clicking the big blue button in these emails. You wont get to see a photo of yourself, you will infect your system with a Trojan horse. Social networking has changed the way businesses communicate with their customers and partners, and how people stay connected with friends and family. Most organizations now incorporate social media into their marketing and communications strategies, and many allow their employees use of Facebook to stay in touch even when they are in work. Unsurprisingly, the popularity of this new media has also created an influx of social media specific malware. 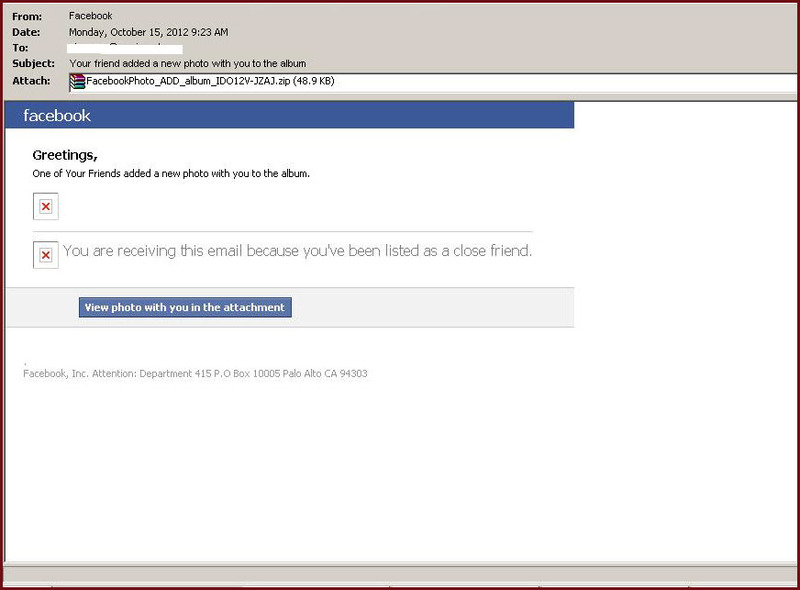 The emails pretend to come from Facebook and saying that your Facebook friend added a new photo of you. This is a scam email that really does not come from Facebook, but is designed by internet scammers to trick the recipient to download or open the attachment. Do not click the link in the email. Unfortunately, the attached ZIP file contains malware, designed to allow hackers to gain control over your Windows computer. FacebookPhoto_ADD_album_[Ramdom].zip, where ‘random’ is a generated number. One of Your Friends added a new photo with you to the album. You are receiving this email because you’ve been listed as a close friend. Facebook users should be aware that the social media site never sends the pictures posted online as attachments via email. Therefore users are always advised to beware of shady-looking notifications. And as always, to not click on links in emails. Mailwall Remote is Omniquad’s hosted Email Security solution which filters emails for business users, ensuring virus, malware, spam, phishing attacks, etc are quarantined for later review and kept away from their users inbox. To illustrate, above is a screenshot showing how the emails are quarantened. As many as 3 different Facebook scam emails carrying malware within the morning. Follow our blog for more information about scams, phishing attacks and malware. Follow blog to be notified of new posts by email.